Heat the oil in a large saucepan, adding the thinly sliced capsicum, and red onion and cook until soft. Add the garlic and cook for a further minute until fragrant. Then add the tomatoes, stock and 1 cup of filtered water, and bring to the boil. Reduce heat and simmer for around 10 minutes. Allow this to cool a little. 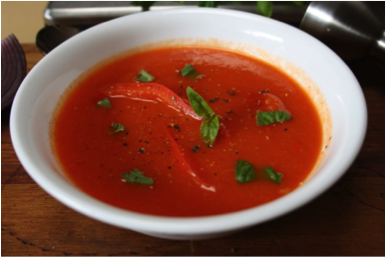 I like my soup a little chunky, and so I remove about a cup of capsicum and tomato before blending, then stir it through after blending. Otherwise, just blend the whole mixture for a smooth soup. Take care at this stage not to allow the steam to burn you. Serve with a little torn basil sprinkled on top and a little freshly cracked pepper. *Fun Fact: Phytochemical properties found in capsicum help our bodies in many ways, including helping to reduce arthritis and the effects of Crohns and other digestive issues. The antioxidants improve our skin and reduce the effects of aging.